Besides all the funtionality available in the GO Edition, CardExchange® Producer Premium enables unlimited records when using MS Excel files and makes it possible to customize your data edit window. It also includes powerful functionality like signature capturing, user logins, and drop down menus! By using the photo options, you can, for example, configure the Take Photo button to import a photo instead of calling a camera. All these settings in the Photo Options section can be applied separately for each connected card template. That means that for each connected card template you can set if the photo is coming from a scanner, camera, or imported from a file. 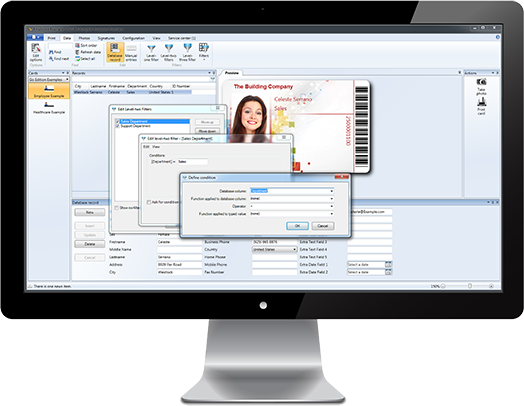 Using the options makes it also very easy to create actions when printing cards, like automate what to do when there is no photo available, you can control your print process to avoid errors as much as possible. In production areas you can simply let CardExchange® Producer automate your process by creating actions if you insert a record to your database. The Premium Edition offers functionality that mostly does the job for smaller businesses.